Kia testing waters for electric all-wheel-drive runabout. 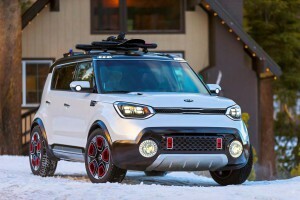 Kia's Trail'ster Concept is ready for a winter romp. The concept debuting at the Chicago Auto Show is the maker's take on a rugged off-roader. Can a “cute ute” also deliver some serious off-road credentials? That’s what Kia is determined to show with the Trail’ster Concept it’s debuting at the 2015 Chicago Auto Show. It takes only a quick glance to recognize the show car is based on the familiar Kia Soul. In Trail’ster trim, the quirky compact crossover gets not only the skid plate treatment, but also a rollback canvas roof. But even more intriguing is what Kia refers to as an eAWD system, something that has also been called “through-the-road” all-wheel-drive, with a turbo gas engine driving the front axle and an electric motor running the rear. With Kia and its sibling Korean brand Hyundai rolling out an assortment of new hybrids, plug-ins and pure battery-electric vehicles, might a production Trail’ster be in the offing? 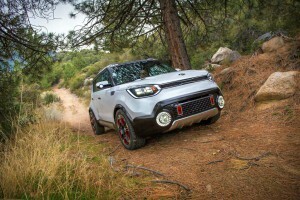 “The Trail’ster concept is a near-future look at how the production Kia Soul would logically evolve into an AWD-capable version that’s built to escape the city streets and roam into the mountain wilderness,” hinted Tom Kearns, the chief designer at the California-based Kia Design Center of America. Kia uses a small electric motor for the rear axle to provide all-wheel drive capability and improved fuel economy for the Trail'ster. In recent years, automakers have been steadily downplaying the traditional off-roadability associated with classic SUVs, arguing that the vast majority of buyers will never use their utes on anything tougher than a gravel road or snow drift. But they’re now beginning to target a new group of young, urban buyers who might want to live more active lifestyles on the weekend, whether that means camping, hiking, snowboarding or sailing. So, the goal of the Trail’ster Concept was to “take the go-anywhere capability of an SUV and reimagine it within a compact and sporty package with an expressive design to match,” explained Kearns. Rather than trying to make the major changes needed to drop in a driveshaft for the rear wheels, Kia reached into its tool box and found an electric drive system from the Soul EV that it could modify to power the back axle. It uses a 27 kW, 270-volt AC synchronous electric motor making 35 horsepower and 100 pound feet of torque. A 1.2 kilowatt-hour lithium-ion battery is tucked away under the Trail’ster’s load floor. The front wheels continue to do the heavy lifting, as with the front-drive Soul. There, Kia has turned to a 1.6-liter turbocharged four-cylinder engine putting out 185 hp and 185 lb-ft through a six-speed automatic transmission. All told, the combined system makes 220 horses and 285 pound-feet of torque. So, even with the added power and all-wheel-drive capabilities, “should the Trail’ster find its way to production,” Kia estimates the a 25-30% improvement in city mileage and up to 10% more on the highway than the 2015 Soul with its naturally aspirated 2.0-liter gas engine. The electric drive automatically switches between three driving modes. In light use, the Trail’ster can run as a pure EV, as long as there’s charge in the battery – about two to three miles. Under normal conditions, the battery drive assists the turbo engine during acceleration; and it kicks in when the system detects wheel slip in off-road and wet road situations. To give the concept a bit more off-roadability, the body rides about 2.5 inches higher than a production Kia Soul. Trail’ster also gets armored skid plates, KSport coilover shocks and Pirelli Winter Carving 19-inch tires. The retractable canvas roof, meanwhile, not only offers an expansive view of the sky but also lightens the Trail’ster and lowers the ute’s center of gravity, Kia says. The vehicle makes extensive use of LED lighting, inside and out. The interior gets a beefed up center console with a thickset gear shifter, AWD controls and a bright red Start button. The brown leather seats and other surfaces of the Kia Trail’ster Concept feature step-up materials compared to the classic Kia Soul. Will they build it? It appears the Korean carmaker will be watching closely to see how potential buyers respond to this “rugged runabout” at the Chicago Auto Show and subsequent shows. Strong demand could see it bring the show car to a trail near you.